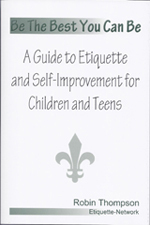 A simple and easy to use guide to good manners, self-improvement and social skills. 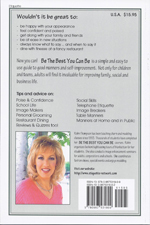 Be The Best You Can Be is the textbook used in the Robin Thompson Charm School classes. A written version of Robin's 6-week course, her book is the next best thing to attending charm school. The 106-page book has an easy to read, concise style that doesn't talk down to children and teens. How Can Good Manners Help You? Have you ever been nervous and not sure of what to say or do? Whose name do you say first in an introduction? What do you say when you write a thank you note? You have 3 forks at your place setting; which one do you use first? You're at a friend's house and find you hate the main course. Now what? What if you go to a party and no one talks to you? What to do? Parents ~ If you want your children to be well mannered and happy, let 'another voice' help them become confident and self-assured. A good 'anytime' gift especially from grandparents, uncles and aunts and those who care! Give the Gift That Lasts a Lifetime. Order Now! Robin will personally autograph each book. Discounts available for schools, churches, and non-profit organizations. Please contact Robin at robin@etiquette-network.com. Young people have a strong desire to fit in and be like everyone else. Robin's charm book teaches that everyone is special, and it's good to be unique. Society is once again realizing the importance and necessity of good manners, etiquette, charm and image. They are but simple guides in helping you have a wonderful life. Give the Gift of Confidence... It Lasts a Lifetime!